American actor best known for roles in films such as National Lampoon's Christmas Vacation, Independence Day, Brokeback Mountain, Midnight Express, Elvis, Kingpin, The Last Detail, Not Another Teen Movie and Quick Change. He's a big guy. He's like 6-foot-5. I had no idea. The first time I met him, he was sitting and all of a sudden he stands, and he was huge. "Tons of legit 6ft5 guys who've put down 6ft4" Not true. Maybe a shoe height yes. Randy look 6'5 peak and worst 6'4 3/4 although i never heard him claiming 6'5. Canson at the very worst maybe 195cm. He edged out both Jeff Goldblum (who many argue 6ft4½) and Adam Baldwin (most likely around 6ft4 then) in Independence Day. He generally looked noticeably taller than 6ft3 range guys. 6ft5 peak is a safe enough bet. And tall actors were actually advised to downplay their height to secure more parts. What are the chances he was just 6-4. 6'4.75" peak and 6'4.25" now. Rob maybe a small downgrade? He really cant have been taller than a guy like kobe bryant at peak. 195 cm flat is better . average guess is to low. The possible heights for him is 194-195,5. I would personally think maybe 195 cm peak. I do think he'd be about James Avery's height. I put them both at 6'4.5", personally. Rob 6ft4.75 like james avery? A lot of people forget he was a full member of Saturday Night Live's cast in 1985-86. And, if I am not mistaken, he's the tallest cast member in SNL's history. this guy was always tough to get a read on because of his horrible posture i'd say he is a tweener not 6'5 but bigger than 6 '4 flat'194 range but who knows? his posture is horrible. did you ever meet him rob? Never seen him, seems he has had a hard time last decade. Probably has lost an inch by now. I met him in New York back in 1995 when he was probably around 45 years old and I am a solid 6-2 and I stood next to him and he is a very big guy. I would say he was 6-5 at that time. Maybe lost a bit over the years. Maybe 6'5 peak and 6'4.75" now. Definitely downplay at 6'4. He look huge compare to his younger brother Dennis. An easy 6'5 back in the day. He easily edged out Chevy Chase in every scene together. Based on his actual career 80s-90 he alawys looked about 6 3 however he was taller than chevy. His posture and build do not give him the lanky super tall guy look, which makes a high guess tough. Personally I believe he and his brother are both listed too high or in shoes. A young stern makes dennis quaid look tiny 5 11 or less, he towers him barefoot standing well behind him. As for Randal never seen him look over 6 4 except in Christmas vacation which he wore various embelishments..
You guys sure he is 6 ft 4? In Midnight Express he did look tall and lanky but he definitely didn't look 6 ft 4. In Midnight Express he is standing side by side with Brad Davis and John Hurt while discussing a Prison break. Randy Quaid was slouched down a bit while talking to Brad Davis and John Hurt. At this point brad Davis head was in the middle of Quaid's forehead. Norbert Weisser the Swedish guy in the movie was not a very tall man about 5 ft 7 maybe 5 ft 8 and he looked 4 inches shorter than Randy Quaid. Randy's height was anywhere between 5 ft 11 to 6 ft when he did Midnight Express. Big, big guy, easy 6'5 at peak, despite the slouch. Nick Cassavetes, however, had him by at least an inch and a half in The Wraith. Nowadays, Randy would have to be no more than 6'4 (perhaps a smidge over) upon arising. Similar height to Robbins but poorer posture. Always hunched over. 6ft4 flat was definitely too low for him…I doubt we're gonna see much from him anytime soon. Gone totally bonkers the last few years! He was 6'4" at his peak. Rob, are you convinced on the full 6ft5? Editor Rob: in his 30's I think he could pass for it...standing tall he looked nearer that than 6ft 4. Definitely a 6'5. What do you think about his wife Evi? 5'11 range? Click Here Looking at Randy read the nominees with 5'6 Gena Rowlands, if not a full 6'5, maybe give him a 6'4.75 mark? Looked a very believable 6ft5 in The Last Detail. Nicholson had to tilt his head back to make eye contact with him and he wasn't that short (5ft9-10). Rob can you update with photo and films The Last Detail, LBJ: The Early Years, Brokeback Mountain, Midnight Express, Elvis, The Apprenticeship of Duddy Kravitz, The Missouri Breaks, National Lampoon's Vacation and Independence Day. Dwards Jack Nicholson in The Last Detail. Makes him look like 5 ft 7 in it haha. An old photo of when Randy was a cast member on SNL. 6'6.5 Penn Jillette stands behind him. What do you all think of this? Could a bit past 6'5 be in question? Quaid is in the 6'4" range. Matthew, Randy is standing in front of Penn. The difference in height might be more than it looks in that photo. He could look near 6ft5 in SNL I thought. If Dennis was 6ft, then it's not out of the question. He towered over him. @James: He looked quite lean on Independence Day. That's an absolute given. Conspiracy nutcase. It's a real shame because he was great talent. 194-195cm range in his 20s-30s is a good shout though. He'd be well north of 260lbs today. Rob, is there a chance he might be 6ft4 flat today? I'd bet recently, he's weighing a lot more than 200 pounds, it's hard to picture him being ever that light since he has a large build. No one's going to find out least they use a tranquilizer gun for a bear because he is wild & insane. Met Randy Quaid in 1989. Had to look almost straight up to talk to him. I'm 5'10". 6 foot 4. He is really tall. Slightly taller than chevy chase. Sad to see his career go down the drain. Always looked like a strong 6'4". He looked 6'4" to me in the few films I've seen. Never thought he looked over it. murray is 6'1 and could be shorter nowadays. That guy has to be 6'5" at least, he had inches on Bill Murray who is 6'2". Well, 6'5" could describe his height. He looked about 4" taller than Bill Murray. 6'5" is it. Well in Kingpin he looked only 6'3" but in several films he looks close to 6'5". a strong 6ft4.5. no way over or less..
All of my life, I always believed Chevy Chase to be 6'4", but standing next to Randy Quaid, who has to be 6'4" tops, I am starting to think that Chase at best really is 6'3" all of his life, and like many men, loves to accentuate his height. 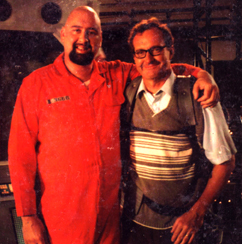 Usually, Chevy is taller than every man he works with, but only Randy Quaid is just a little taller. I'd say 6'4 3/4" at peak or 6'5". And About just 6'4" today. Close to 6'5"? Well, he's at least 6'5". He's probably more 6ft4 flat nowadays. He is in his 50's. I saw new pics and Quaid is definitely taller than 6'4"! Randy Quaid looks more 6'5". When I stated on 17/Apr/08 that my buddy was 6'3" and he had worked with Randy Quaid, I forgot to mention that my actor friend Mark Smith was 6'3" in his bare feet! He most always wears cowboy boots which make him approx 6'4.5" If you look at the scenes of Mark with Randy togeather in Independance day, yes they are the same size, and randy is also wearing similar cowboy boots, which would make them both stand about 6'4.5" and that would make them both about 6'3" in bare feet. footware makes a big difference! I am 6'2" in my bare feet, but i have a pair of "Frye" boots that make me easily 6'4"
Randy Quaid is 6'5" and end of discussion! Chase was NOT 6'3" in Vacation. Since when was he 6'3" in the 80's?? Chevy had at least 2" on John Candy in 1983 and was inches taller than Dan Akroyd in Spies like Us. Chevy was 6'4" MINIMUM. In Fletch the basketball commentator says that Chevy is actually 6'5" and 6'9" with the Afro. NO 6'3" for that man. MAYBE he's leaning towards that today in his mid 60's, but not in his prime. Whatever Quaid was, he looked short next to Nick Cassavetes in 1986's Wraith. he looks 6ft5 in Another Teen Movie in 2001..
To me towering over would be 4-5 inches or more. Richard.... you said he's 6-4 and towered over the 6-3 Chevy Chase......how is one inch TOWERING over someone? You can barely tell the difference!! I agree with Alex, clearly taller than Chase in Christmas vacation, perhaps even 1.5 inches. If Chase is 6ft3.5 then Quaid must of been shade under 6'5 when filming in '89. Was an inch taller than Chevy Chase in the Vacation movies so 6'4.5-6'5 seems right. Chyler Leigh on Randy: "He's a big guy. He's like 6-foot-5. I had no idea. The first time I met him, he was sitting and all of a sudden he stands, and he was huge"
He looked around 6-4- in the 80s. I remember watching Parents(1989) and he pratically towered everyone on set so yeah 6'4" is the right height. I always thought his brother,Dennis, was taller than him but he is only 6'1''. I thought he was menacing in the movie Parents, absolutely intimidating. I believe he is 6'4.5, because he towers over Cusack in the Ice Harvest, another classic movie. I think the 6'4 1/2" is right. Not quite a full 6'5", but over 6'4". He absolutely dwarfed Woddy Harrelson in Kingpin. Its all depends on how tall chevy chase is. in all those movies he looks to have a good 1.5" over him. Wow.he walked by me,last summer and I thought 6-3.I am wrong sometimes. Randy Quaid is my cousins's ex-boyfriend and i've met him about 3 times. He's really cool and i was able to ask how tall he was. He said he was 6'5'' so i believe him.